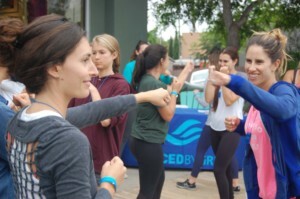 SOLANA BEACH — In a continued commitment to empower women, a Solana Beach active wear company hosted a free self-defense class for women and girls of all ages Aug. 23 on the sidewalk in front of the Solana Beach store on Coast Highway 101. Del Mar resident Kelly Kass, left, and Morgan MacBaisey of Encinitas partner up to practice quick jabs. Andre Bosier, a retired Marine who led the class, said failing to commit is the biggest mistake females make when attempting to defend themselves. “They’re afraid to break the rules,” said Bosier, a trainer and general manager of TITLE Boxing Club’s La Costa branch. “They don’t want to cross the line and hurt someone. In that situation, most women may have the advantage because they already have space between them and the potential attacker. If escape is unavoidable, Bosier said victims need to approach the conditions mentally and physically. “Get over the shock and accept the fact that you’re in the situation you’re in,” he said. Additionally, attract attention by either blowing a whistle or screaming. Bosier said the best self-defense stance starts with bended knees, and he demonstrated the proper way to make a fist. Rather than focus on throwing punches, he said, victims should use quick jabs. He also pointed out the ideal “parts of the body where you can cause pain,” such as the nose, ears and neck, and the best methods to do so. Bosier said it’s also essential to “find the exit,” or the best way to get out of the situation. But most importantly, he added, never do anything alone whenever possible. About 35 people, a few as young as 11, attended the class. Kathy Kaya of Carlsbad said she’s taken boxing classes in the past. “I want to reconnect with that and feel confident I would know what to do and I could do it,” she said. Del Mar resident Kelly Kass said she travels frequently and often finds herself returning alone to her hotel after a business dinner. Caccavo and her partner, Kate Nowlan, created their athletic clothing line in honor of Chelsea King, a San Diego teenager who was murdered in 2010 while on a run near Lake Hodges. While speaking to a triathlon team, Kelly King said her daughter might still be alive if only she had a place for her phone or a whistle. Caccavo was in the audience. Inspired by that thought, she and Nowlan launched a home-based business selling active wear that featured pockets for phones, a detachable whistle, reflectivity and 50-plus UV for skin protection. After expanding to the Solana Beach store in 2015 they introduced the Chelsea legging, featuring a sunflower design and made from recycled water bottles, combining Chelsea’s favorite flower with one of her passions. 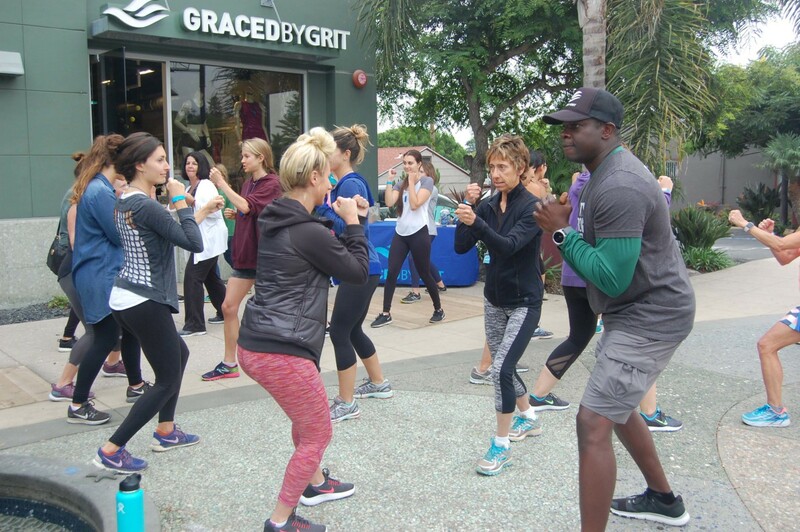 Graced By Grit has hosted self-defense classes in the past but they weren’t very well-attended, according to Alexandra Vidaeff, the company’s communications manager. 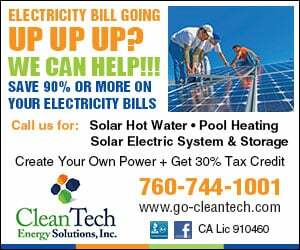 She said the owners decided to increase their marketing efforts in response to an attempted kidnapping of a 15-year-old girl in Leucadia in July. About 70 people responded to the beefed-up social media campaign. Those who couldn’t attend said they would be interested in future classes. Vidaeff said Graced By Grit is considering offering them monthly.